This traditional hunter-warrior dance vividly depicts the dependence the Indians have on the Great Spirit for both personal protection and supply. Colorful and dramatic, you can feel the throbbing drum beat within your chest and faintly hear the haunting, quiet, whispered song. 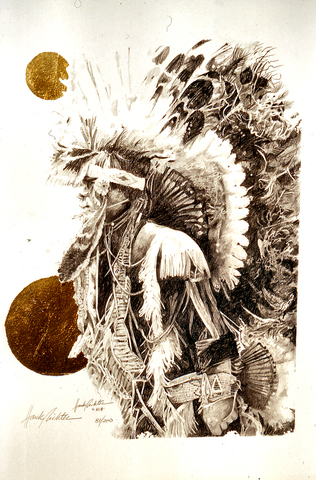 The unusual application of gold leaf foil makes each print a one-of-a-kind collectible.